We recognize the religious guidance, prayers & support that our school parish provides. Students participate in ministries at the Noon Mass, followed by Open House from 1-3pm. Take a tour, visit the featured spaces, talk with a teacher and stop in the office for business. Everybody is invited to explore our school. We recognize the value of service to others. Wear your favorite team outerwear with your uniform. Thank you cards will be sent to all who share in the mission of guidance and service to others. We recognize the importance of our faith & using our talents to serve God & others. Wear your silly socks with your uniform and join us for our school Mass where we honor Msgr. Tim and Fr. Andrew in their vocation to Catholic Schools. Donuts and coffee will be served after Mass. We recognize the Spirit in our students. Students participate in an assembly in the afternoon, games, a little friendly competition and enjoy a dress down day. 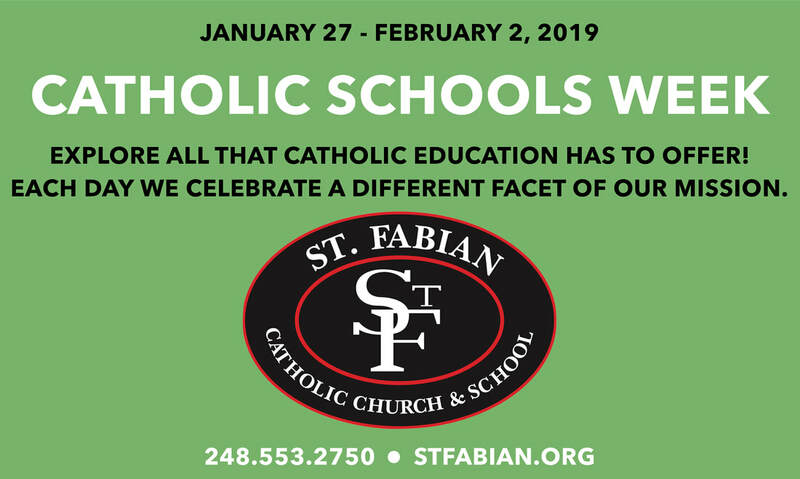 We recognize the dedication of Catholic school staff. Student Council students serve breakfast for the teachers. Write your teacher a thank you note! Student Council Officers represent our school at a Mass celebrated at the Cathedral. We recognize the commitment the volunteers express to support the parish’s ministry to Catholic education. Students decorate posters that illustrate the "Ministers Make a World of Difference" theme for our parish volunteer dinner on Saturday in their sprit wear.